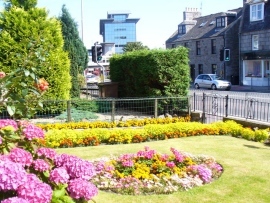 "Crown Terrace, Aberdeen - geograph.org.uk - 1329304" by Bill Harrison - From geograph.org.uk. 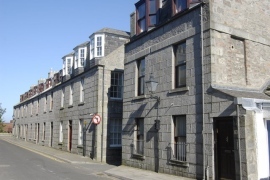 "Holburn Street - geograph.org.uk - 1460726" by Colin Smith - From geograph.org.uk. "Satrosphere, Links Road - geograph.org.uk - 401659" by Colin Smith - From geograph.org.uk. "Stoneywood House - geograph.org.uk - 1360671" by Bill Harrison - From geograph.org.uk. 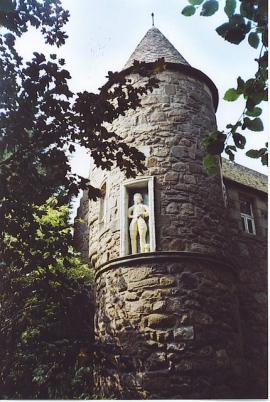 "Wallace Tower, Seaton Park - geograph.org.uk - 221403" by Colin Smith - From geograph.org.uk. 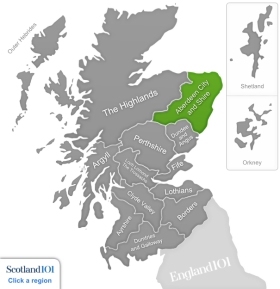 Unsurprisingly the main city in the region of Aberdeen is Aberdeen. The city of Aberdeen is the third most populous city in Scotland and nicknames include The Granite City and the Grey City. This is because the buildings were made from grey granite from the local quarries, which sparkled in the sun. 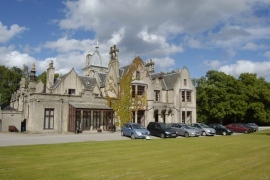 The Gordon Highlanders Museum preserves the legacy of the Gordon Highlanders. Located in the former home of artist Sir George Reid, the museum prides itself on the ever evolving unique experiences it offers for its visitors. These include special events for occasions such as the commemoration of WWI, and offer brilliant activities for the family such as making poppies, colouring, a treasure hunt and an educational WWI re-enactment. 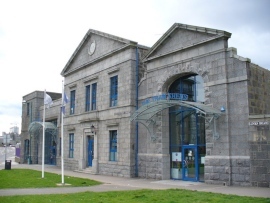 Aberdeen has prospered from the fishing industry since the early 20th century and now from the oil industry, which is reflected in the Aberdeen Maritime Museum. Educating visitors about the maritime industries through ship displays and informative documentaries, it is a popular attraction in the region. It even has a simulator so you can navigate your own ship through treacherous waters! Linn O'Dee is a great spot to visit for a refreshing walk, especially if you are a fan of waterfalls. After you begin your journey, you will soon hear the crashing of the River Dee trying to get through the hole in the Scots Pine Gorge. If you are brave enough to tip toe to the edge of the gorge, you will truly experience the full effect of the swirling torrent of water. Be aware to keep children away from the edge however, as there have been fatalities in the past. The drive from Braemar is six miles of picturesque landscape featuring pinewood forests, picnic spots and the flow of the River Dee. A trip to Scotland might not scream 'sunbathing!' but once you get past the fact you are unlikely to be soaking up any rays, you can appreciate the understated beauty of the beaches here. The coastline of Aberdeen is one huge stretch of sandy beaches. Balmedie Beach is one of the best, found to the north of Aberdeen city. It escapes the usual touristy 'seaside town' feel by avoiding any fish and chip shops or bars etc, leaving you to enjoy the tranquil rolling dunes in peace. Sometimes seals will even swim to the shore and lay out on the beach, however the dolphins keep their distance out in the ocean but can still be spotted with binoculars.